There are so many things patients and families love about Chemo Duck. But this time, we want to want to share the love. Here are two groups Chemo Duck loves to quack about: The Cooper Trooper Foundation and The Sarah Grace Foundation. 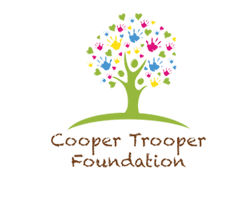 The Cooper Trooper Foundation (CTF) supports the fight against cancer in two ways – one by raising money to help fund research into pediatric cancer and the other by helping distribute Huggable Hope, the companion to Chemo Duck for siblings of patients going through cancer treatment. Huggable Hope is part of the Courage Kit created by CTF. The organization sends out hundreds of kits every year to siblings all across the country. “It’s hard to balance giving them the attention they need when you are caring for a sick child,” said Missy Cook, founder of CTF. “They are unintentionally left out. They are the heroes in the shadows and this was a small way to let brothers and sisters know they are very much a part of the fight. Cook, whose youngest child will be cancer free for six years, knows first-hand the need for sibling interaction. Her two older children were inspiration for the kits. CTF compliments the work that Lu Sipos, founder of Chemo Duck, strives to achieve. Sipos says she was one lucky duck to learn about the Sarah Grace Foundation, which helps children and their families during the challenge that childhood cancer brings. For the past five years, the foundation has sponsored Chemo Ducks for about eight hospitals in the New York region. For Sipos the foundation’s commitment to distribute chemo ducks is not the only reason she admires the organization.